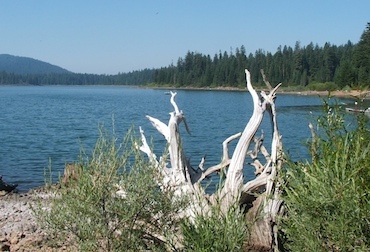 Fish Lake is located in the Southern Oregon, in the Cascades mountain range. At an altitude of close to 4800 ft., and in the midst of a forest of old growth Pine and Fir, it is truly an enchanting mountain lake. 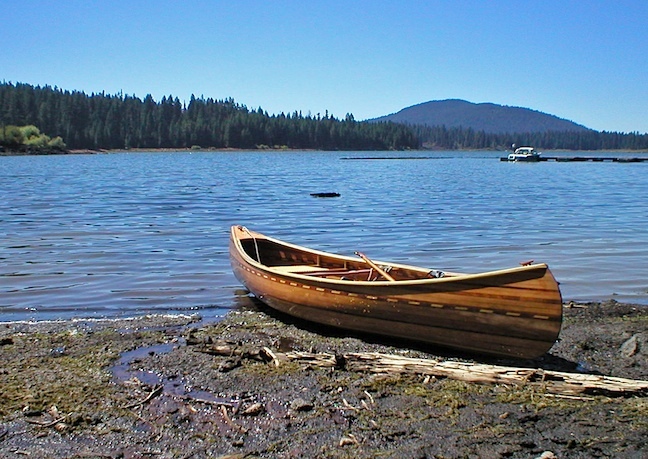 Fish Lake is only seven miles west of Lake of the Woods. Camping grounds and boat launch are operated by the Rogue River National Forest Service and, Fish Lake Resort which includes Cabins and the Tadpole Cafe. 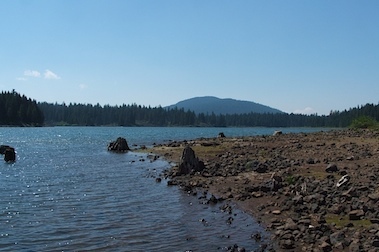 Here is a view of Fish Lake looking toward the west from the Fish Lake Resort campground. 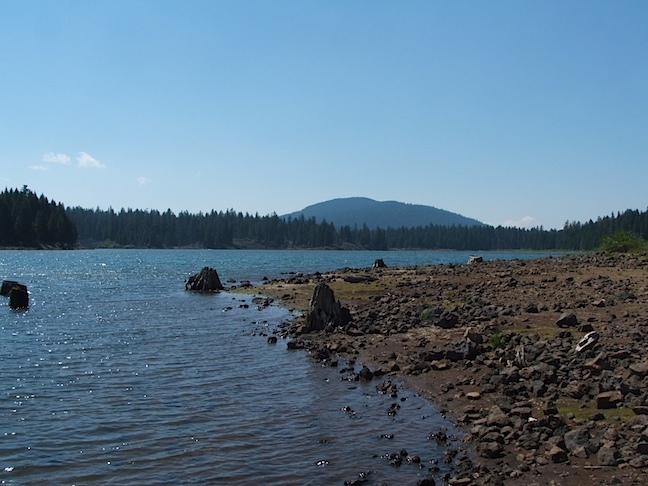 The shoreline here is strewn with lava rocks which were blown from the Brown Mountain volcano (just to the south-east). The resort has a nice gravel beach which is good for swimming. On the right is a view from Doe Point where we camped for quite a few years at the Rogue River National Forest campground. With no hook-ups, our trailer kept us well serviced for five nights. Fishing is good here. The mountain in the background is Robinson Butte. 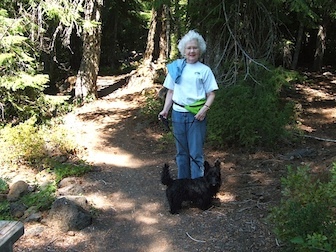 Here are Kate and Maeve on the trail near Fish Lake. This trail is part of the Pacific Crest Trail which goes from Mexico to Canada. We have seen many hikers doing this trek, all the way from border to border. On the right is a slight departure from Fish Lake. This is the north-east corner of Lake of the Woods. 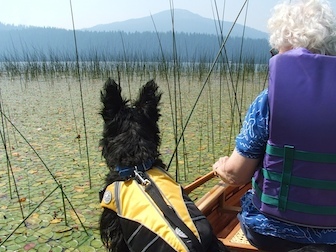 Here for a day trip of paddling and swimming, we paddled through one of our favorite spots, the Lilly Pad Cove, looking for lumkers in the water below the lilly pads. Brown Mountain is in the background. 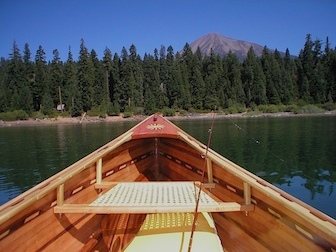 Here is one of my favorite views from Fish Lake, Mt McLaughlin. Standing at 9,495 ft., it is especially pleasing in the early spring while still covered with winter snow. On this day I did some fishing but did not manage to hook the big one. 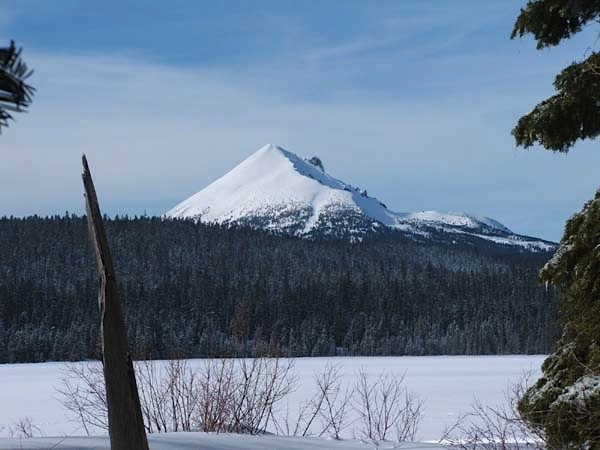 Click for a view of Mt McLaughlin in winter, taken from Lake of the Woods. 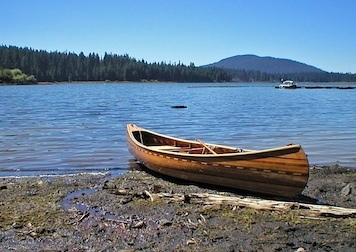 Here too, Sunshinge is having a rest on the lake shore. I found a muddy spot where a creek runs in, near our campsite. This was a good place to pull her up without too much scratching on her bottom. A sunset at Fish Lake. In this picture I just missed the sun as it went down in the far west. I did, however, get the image of the three day old crescent moon with Venus a little higher in the evening sky. They are over just the crown of Robinson Butte and their reflections can be seen on the unruffled water.